After a long winter with much snow and record breaking freezing temperatures, a walk on the trail by the Clark Fork River took me to Caras Park. Here I found a work of art that continues artfully to bring delight to folks of all ages. This “Carousel for Missoula” has a wonderful and amazing story of how it was imagined, created and continues to operate with the support of a non-profit volunteer organization year round. A man by the name of Chuck Kaparich, grandson of a Croatian immigrant to Butte, Montana in the early days of the 20th century, who worked in the mines and raised his family in that city, had a photo taken of he and his wife and seven children in front of a carousel in Butte and sent it to his relatives back in Croatia to show that he had made a success of his life. His grandson was visiting the carousel in Spokane, Washington in 1989 and when he saw the carousel there, the memory of that family portrait touched him deeply and he began to cry. As he read the story of that carousel and learned that every horse was hand carved by a Danish immigrant, Charles I.D. Looff, as a wedding present for his daughter early in the 1900’s, his own story with the carousel began to be written. Chuck began in earnest a search for anything and everything he could learn about carousels and reliving his childhood memories of the carousel in Butte he was determined to learn how to carve and to make a carousel. This carousel he would make for his grandfather and it would be in Missoula, Montana. For his birthday in 1990 his wife got him a set of carving tools. His journey with the tools and the carving of the wood, collecting images to use so that each horse would tell a story, began with a dedication to carve each day before going to work. As Chuck carved the horses he could see them spinning around on a carousel in Caras Park, in downtown Missoula next to the Clark Fork River. He decided that if his dream was to become reality he needed to get that piece of land he saw in his dream secured for a carousel. He loaded one of his horses in his truck and went to see the Mayor. After a long conversation the mayor finally agreed to this dream plan. Next it was to convince the city council of the dream with four carved horses and each step of the way believers in the dream gathered around him. A foundation was formed and a team of volunteers worked on the project until the dream was reality and the carousel opened in 1995. The involvement went to the community of people and organizations who adopted ponies that were being created, each one telling a story and using colors and symbols that reflected who they were. The ACFM, a Carousel for Missoula, organization has a website at http://www.carouselformissoula.com where you can see individual horses and learn about how this organization now 19 years later still operates the carousel and the “Dragon Hollow” playground without government funding. 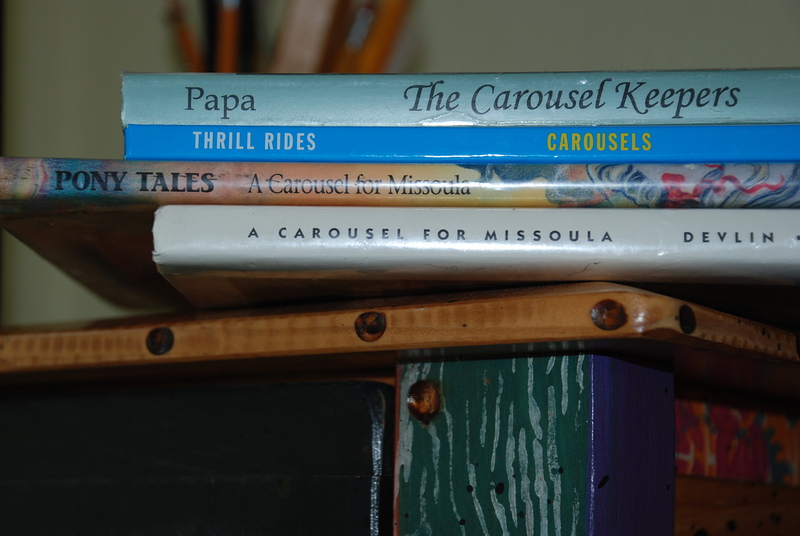 Here is a photo of the books I first read as the journey to learning about carousels began for me. In my search for information about carousels, historical locations and creators, I discovered that still today carousels from the 1800’s and early 1900’s are to be found around the world, still operating and delighting folks of all ages. A visit to Wikipedia will give you links to so many places that have information about the carvers, many of them regarded around the globe for their talent in holding the tools just so in their hands to slowly remove pieces from a block of wood until it took on the life of the animal in the maker’s vision, most often horses. The “heyday” of carousel creation was just at the turn of the twentieth century. The book “The Carousel Keepers” is a fascinating recorded history of the carousels and the places where they “live” in New Jersey. This oral history project was completed under a grant from the Historical Society of New Jersey and the book published in 1998. The book, “Thrill Rides – Carousels” is a children’s non-fiction work and has some great stories, information and photos. “Pony Tales: A Carousel for Missoula” is a most wonderful children’s book with stories by twenty-four writers and illustrators from Montana. The carousel was so familiar to folks that when the Broadway musical “Carousel” was written by by Richard Rodgers and Oscar Hammerstein II, the public knew that the story was going to be set at a carnival. This stage production is a perennial favorite that is often performed by small theatre companies across the USA every year, and was created also as a most successful movie. Carousels in the Coney Island Style, the Military Style and the Country Fair Style are still operating in parks and building designed especially for them around the US, in England, the Netherlands, Germany, France and Australia. Treat yourself to a return to the memory land of childhood summer picnics and outings with a visit to one of these works of art. An historical treasure of the skilled carvers, painters and story theme researchers for over a century. Art is not just to be found on the walls of museums or carved in stone, or cast in bronze…..the carousel provides a look at art in motion, art for everyone, art to ride.